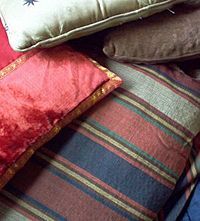 A cushion is a soft bag of some ornamental material, stuffed with wool, hair, feathers, polyester staple fiber, non-woven material, or even paper torn into fragments. It may be used for sitting or kneeling upon, or to soften the hardness or angularity of a chair or couch. A cushion is also referred to as a bolster, hassock, headrest and a sham. Cushions and rugs can be used temporarily outside to soften a hard ground. They can be placed on sunloungers and used to prevent annoyances from moist grass and biting insects. Some dialects of English use this word to refer to throw pillows as well. The cushion is a very ancient article of furniture; the inventories of the contents of palaces and great houses in the early Middle Ages constantly made mention of them. Cushions were then often of great size, covered with leather, and firm enough to serve as a seat, but the steady tendency of all furniture has been to grow smaller with time. Today, the cushion is considered an upholstery item. Cushions were, and are, used as seats at all events in Italy and Spain at a very much later period, and in Saint-Simon's time it is found that in the Spanish palace they were still regarded as a peculiarly honourable substitute for a chair. 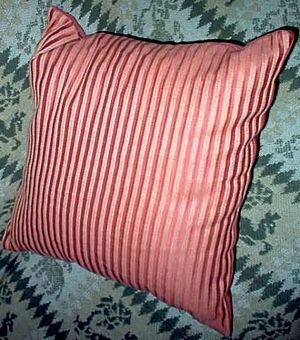 Decorative cushions are likely to have a fancy cover material which are patterned style and generally used on furniture. Cushion Facts for Kids. Kiddle Encyclopedia.